KDM Contracting Inc. is a 29 year, Arizona based concrete and masonry contracting firm specializing in commercial projects, bondable up to $5 million. KDM Contracting, Inc. has extensive expertise with intricate concrete placement to include: monolithic, post tension, deck poured concrete and architectural concrete construction as well as footing and stem. KDM Contracting, Inc. specializes in podium decks, parking garages, slab on grade, architectural concrete finish with high “F” numbers, elevated decks, multiple transitions, basement wall construction, and beautifully finished countertops, colored, textured, and exposed aggregate concrete. 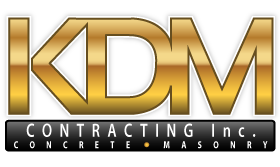 KDM Contracting, Inc. constructs masonry walls of all kinds – basements, stems, retaining, and site walls. We perform high quality brick, and stone work too. KDM Contracting exceeds expectations with superior expertise from layout to completion. KDM Contracting, Inc. is based in the Phoenix Metropolitan area and can work throughout Arizona.